People do their best work with a clear mind and fresh air. Why not give your staff an occasional change of scenery? Stimulate creativity and teamwork, and get everyone refocused on priorities and goals. Cedardale/Groveland’s 50 acres are big enough for the biggest movers and shakers. We can host conferences and seminars for hundreds of attendees. With your audio-visual vendors and technical experts, we can transform our corporate outing pavilions into business auditoriums that are perfect for sales training, campaign kickoffs, product brainstorming, and other business needs. While you focus on the bottom line, we’ll focus on the buffet line. Our catering crew will set up bountiful breakfast bars, coffee and snack breaks, and lunch and dinner service according to your preference and budget. We’re so efficient behind the scenes that you could work all day. 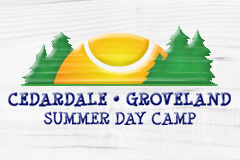 But the Boss will surely want to knock off early and let everyone enjoy the Cedardale/Groveland amenities. So leave those stale office cubicles and factory floors behind, and come spend ‘casual day’ in the country! You’ll profit from the new perspective. Cedardale provides a safe environment for your child to make special memories and friends while also helping them to grow and build positive self-esteem. So come spend your summer with us and let your child experience the wonders of camp! Copyright 2014 Cedardale Groveland. All Rights Reserved.